Please check out Newest Released Field Mounted Display Transmitter TXUN-FD Model for more advanced features and all the industrial certifications. The TX69 is a digital, PC programmable, galvanic isolated two-wire smart transmitter, that converts 13 types of thermocouple sensors; 12 types of RTD sensors, configured as 2, 3 and 4 wires; potentiometer, resistor and millivolt inputs, single or differential.into process current loop. A 3 1/2 digit LED display is integrated forming a transmitter/field monitor unit which is visible in dark installations. A 24 bit A/D converter is the heart of the outstanding performance. The light intensity varies as a function of the current loop, which serves as the light energy source. The transmitter can be set and wired to perform differential measurement conversions of temperature sensors as well as mV sources. The output current is temperature linearized and can be set to be 4 to 20/20 to 4 mA.or any range within these limits. The current is limited to 3.6 and 22 mA. 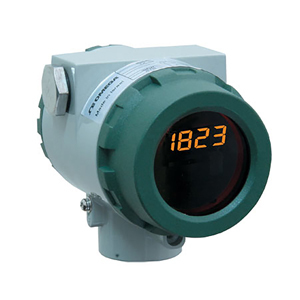 The TX69 samples and updates the output current in a rate of 2 to 4 samples per second depending on the sensor type. It is fully configurable in dry-configurationTM mode by which the connection to PC is performed with no voltage needed, and the configuration parameters are stored in a non-volatile memory. Exceptional digital accuracy of typical ±0.1°C is provided for most sensors regardless of the calibrated span. Extremely accurate coldjunction temperature measurement provides precise compensation throughout the entire ambient range. Detection of sensor breakage or disconnection of input leads, forces the output to a pre-defined up/down scale value. The unit continuously monitors the sensor and automatically returns to normal operation mode when the sensor is recovered. The TX69 is housed in Aluminum enclosure, and the front panel has a special red filter for optimal view. Note: For maximum accuracy for T/C input, all the above error components should be accumulated. Note: Comes with complete operator’s manual and software.